Worcester, MA – Tyler Barnes tied the score with a power play goal with five seconds left in the third period but the Worcester Railers HC (9-10-3-0, 21pts) fell 3-2 in overtime to the visiting Brampton Beast (10-9-2-1, 23pts) in front of 1,877 fansat the DCU Center on Wednesday evening. The Railers host the Brampton Beast again at the DCU Center on a 2-3-4 Friday with a special appearance by Boston Bruins forward Ryan Donato. Tyler Barnes scored the only two goals for Worcester while Evan Buitenhuis, making his first start since Nov 23, was strong making 29 saves in net. Erik Bradford scored at the two-minute mark of the overtime period and Michael McNiven made 29 saves in his first ECHL win for the Beast. With the point, the Railers extended their point streak to a season high four games (3-0-1-0). Brandon Marino (5th) gave the Beast a 1-0 lead at 6:27 after a turnover in the Worcester zone led to a chance alone in front of the Railers net for Marino who then buried a quick shot from on top of the crease. The Railers tied the score at 1-1 as Tyler Barnes (6th) sent a shot along the ice from 20 feet after a Worcester offensive zone faceoff win at 9:29. Shots were 13-11 in favor of the Beast after 20 minutes as each team went 0-1 on the power play. Neither team found the back of the net in the middle frame as Beast netminder Michael McNiven made 11 saves while Evan Buitenhuis made 10 saves for the Railers. The two teams headed to the second intermission tied 1-1 through forty minutes of play. Anthony Beauregard (4th) fired home a rebound from on top of the crease at 13:39 to give the Beast a 3-2 lead late in the third period. But the Railers would tie the score with a 6-on-4 advantage as Tyler Barnes (7th) snuck one in from the side of the net at 19:55 to tie the score at two and force overtime. After Tyler Mueller was stopped by a terrific glove save by Michael McNiven, the Beast barreled back down the other end and Erik Bradford (5th) sent a wraparound chance passed Buitenhuis at 2:00 to give the Beast the 3-2 road victory. Notes: Three Stars: 3rd star: Michael McNiven (29 saves, Win) 2nd star: Erik Bradford (OTG) 1st star: Tyler Barnes (2-0-2) …. final shots were 32-31 in favor of Brampton…. Michael McNiven (1-0-0-0) made 29 saves on 31 shots for Brampton…. Evan Buitenhuis (4-4-2-0) made 29 saves on 32 shots for Worcester…. while Ryan Hubbard served as the emergency backup…. Worcester went 1-for-5 on the power play while Brampton went 0-for-3…. Tommy Kelley (inj), Tommy Panico, Kyle McKenzie (inj), Nick Bligh, Malcolm Gould (inj), and Woody Hudson did not dress for Worcester…. Jeff Kubiak and Mitch Gillam are currently on recall with the Bridgeport Sound Tigers… Ivan Kosorenkov returned to the lineup for Worcester after he was loaned back from the SJ Barracuda….. Ryan Hitchcock (1-6-7) has a four-game point streak after adding two assists…. Tyler Barnes has scored in back to back games and now has points in three straight games (3-3-6)….the Railers are now 2-0-1-0 when Tom Tuesday Matthews reads the starting lineup, 3-0-1-0 when the Matthews jersey is worn…. 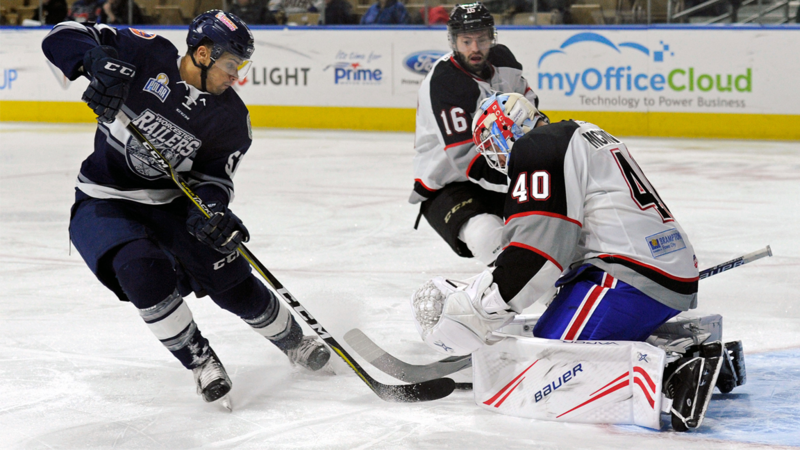 the Railers are in the middle of a stretch where they play six of seven on home ice…Worcester falls to 4-1-1-0 all-time vs. the Beast at the DCU Center…Barry Almeida also added two assists for Worcester…. the power play goal for the Railers was their first in their last six games. What’s on tap? – 2-3-4 Friday! On Friday, Dec 7 the Railers host the Beast at 7pm on a 2-3-4 Friday! Boston Bruins forward Ryan Donato will sign autographs from 6-7:30pm presented by Raymond James Restoration. Score$2 popcorn, $3 soda, and $4 Bud Lights in the Bud Light Lounge! The first 1,000 fans will receive a Chipotle BOGO burritooffer! Tickets as low as $15! The Railers Tavern, located behind the DCU Center provides hockey fans with a great pregame and postgame atmosphere all season long. Watch all road games broadcast live at Nonna’s (FRI, SAT, SUN) or Railers Tavern (MON-THU) or watch on ECHLTV.com for a small fee. Listen to all Railers games live on 98.9 Nash ICON with coverage beginning 30 minutes before puck drop with Eric Lindquist and Tom Matthews. Full season memberships, mini plans, and group tickets are on sale now by calling the Railers front office at 508-365-1750 or by visiting www.RailersHC.com.